7.) Click Close, and you’re done. For those of you who tried but didn't succed, I found some straigthforward instructions for this. Edit the textfile "C:\cygwin\home\Lee\alchemy\alchemy-setup" and uncomment and edit line 22 to: add "export ADL=c:\flex\adl.exe"
# "This should be added before your PATH is modified" !! -- should give you a swc. gcc stringecho.c -O3 -Wall -swc -o stringecho.swc -- should give you a swc. alc-home - takes you to the Alchemy install folder. alc-on - puts Alchemy gcc toolchain replacements at the front of your path. alc-off - restores original path. Flex Builder has a great way to organize its components in tree mode, which is very a good way to organize things and make things clear to any user who are coming to Flex world. 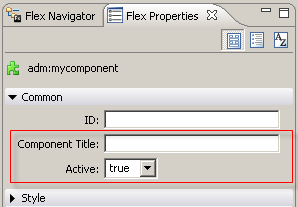 By default, every component you create that is not part of default Flex components you will have placed in the [Custom] directory of Flex Components view in your Flex/Flash Builder, and no matter what properties you add to them, they will never be visible in the Flex Properties standard view. But what if you want to customize that and create a component that have them all like flex components do? Well, it's not that hard so let's do that. 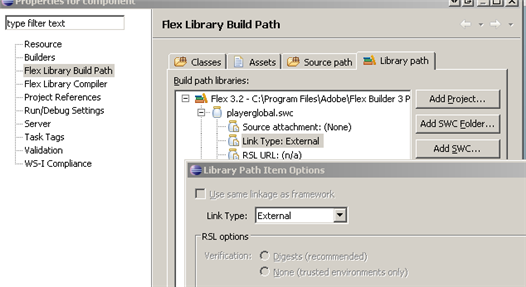 First, you have to create a new Flex Library Project. 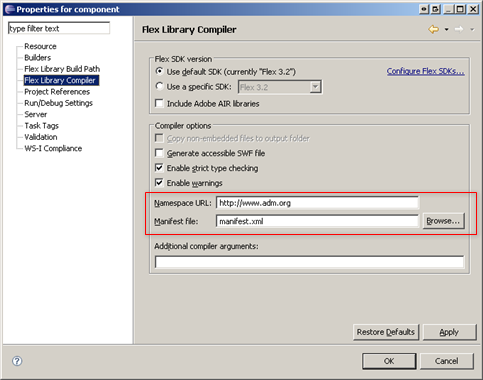 Do this by going to File->New and choose Flex Library Project. Give it a name, a location, choose whatever Flex SDK you wish to build this for and then click finish. Now you have a blank library project in which you can create whatever components you want. Is important to use packages correctly and namespaces and not just drop the component in the [src] folder (you'll see later why). 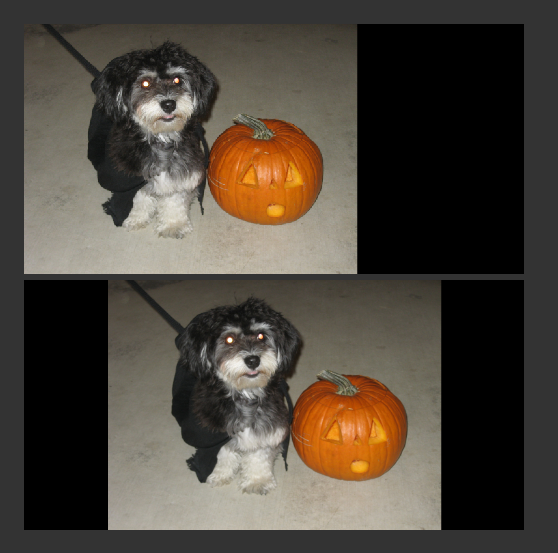 First create a package (eg. com.adm.component) in which you can add your custom component. This is really simple. All you have to do is get a nice looking .png icon (16x16 pixels preferably) and place it next to your component. Then, use the IconFile metadata tag to link it to your component. So, if you want to build a professional component, you can't leave Flex add your component in the default [Custom] directory in the Components tree. So, in order to create your own folder, we must use few tricks. First of all, you need two .xml files to describe the structure you want flex to use and overide it's default behavior. Second, we need another xml to describe the way the designer will interpret all this. In the design.xml, you can specify the namespaces you used for the components, in this case adm will point to components in the org.adm folder. Categories tag describes the folders you want added in the Components panel. Each category must have an id which you'll use to tell components where they should reside, a label for the category to stand as the directory name in the Components panel. 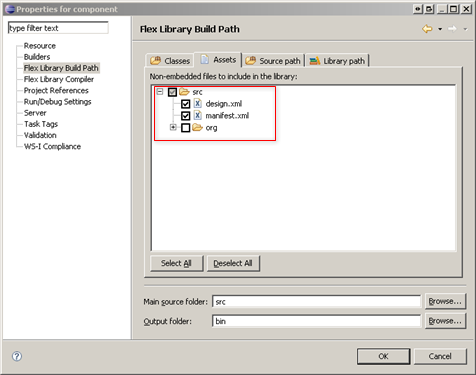 defaultExpand is an optional parameter which if set to true, the folder will be showed expanded by default. 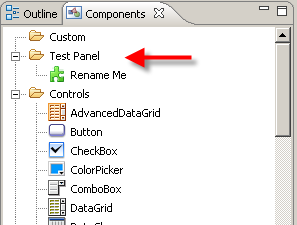 In the components tag, you specify which component goes in what category and under what title. The name parameter must match the id of a component listed in the manifest.xml. All the other parameters are pretty self explanatory. As I said before, no matter what properties you add to your component, they will never be visible in the Flex Properties standard view, only in the category view and that only if you use the [Inspectable] metadata tag. But few more lines in the design.xml file should take care of that. The id of the mxmlProperties tag should be the function/variable names from your component you want to edit. You can also define default values for those properties using the defaultAttribute tag below. Here we've only used the textfield and the combo type but there are few more you can use. For combo boxes, if you use it for a Boolean property, it will automatically be populated with [true,false] values but if want something else, the [Inspectable] metadata tag has the enumeration property where you can define the properties from this combo. Another thing you must do in order to apply the values as soon as you change them from the properties view, is to set the functions/variables as [Bindable]. Now the swc component only have 4KB. Big cut down, eh ? If this is to much trouble for you or you've missed something, I've attached the sources for this tutorial here. You can import this skeleton rename the package, namespace and the component and start building on this. I hope it all made sense and....happy coding.